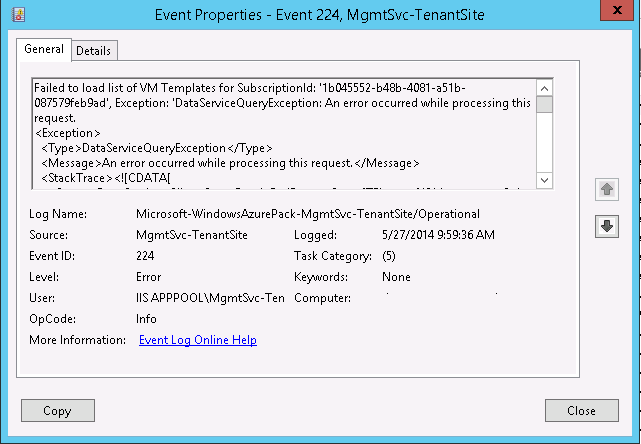 We encountered problems with Windows Azure Pack and tenants loading subscriptions / templates. 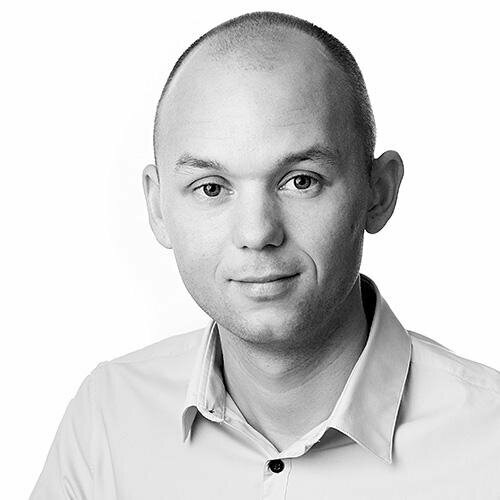 Also have seen a blog by Markus Lassfolk at http://www.isolation.se/azure-pack-failed-to-load-virtual-machine-templates-for-subscription/ going by on Twitter with a workaround for this problem..
Failed to load list of VM Templates for SubscriptionId: '1b045552-b48b-4081-a51b-087579feb9ad', Exception: 'DataServiceQueryException: An error occurred while processing this request. 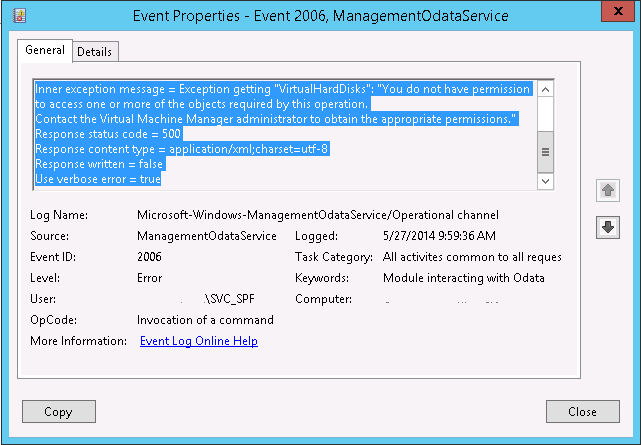 Operation manager plugin method 'GetAssociatedInstances' for resource name 'VMM.VMTemplate' failed with error messsage 'Exception getting "VirtualHardDisks": "You do not have permission to access one or more of the objects required by this operation. 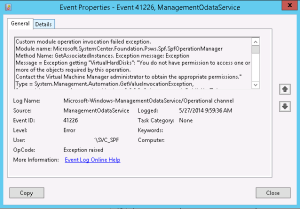 Custom module operation invocation failed exception. 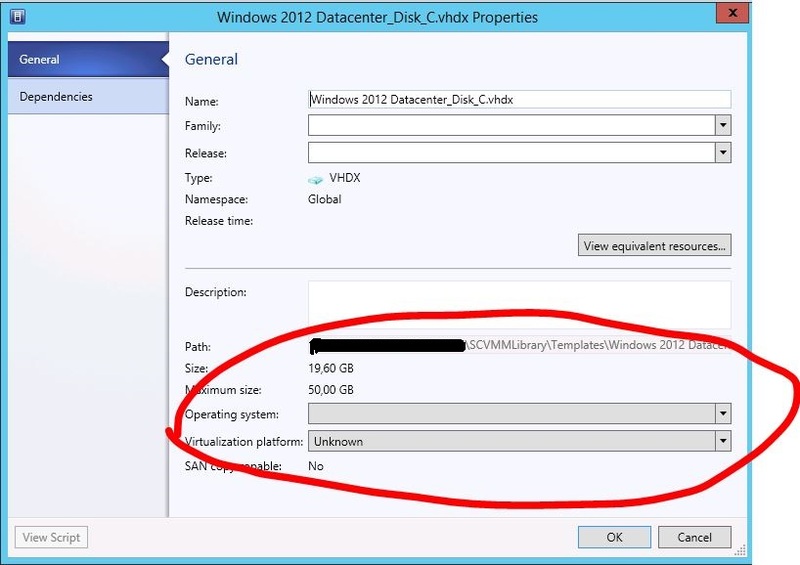 Message = Exception getting "VirtualHardDisks": "You do not have permission to access one or more of the objects required by this operation. 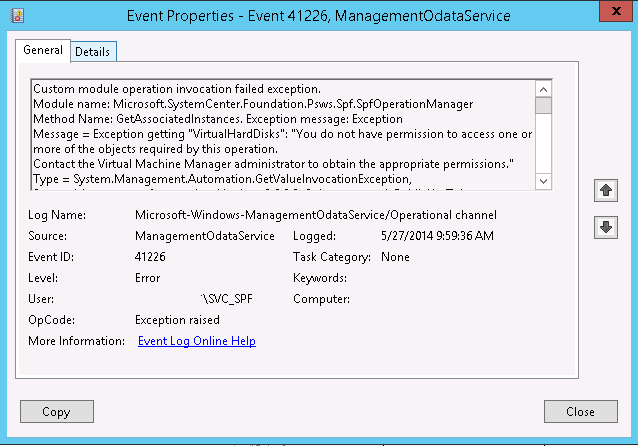 Web Service has got a callback from OData framework about an error. 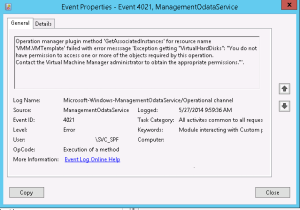 Exception message = Invoking method GetAssociatedInstances of type Microsoft.SystemCenter.Foundation.Psws.Spf.SpfOperationManager failed. Cause of the problem: Exception getting "VirtualHardDisks": "You do not have permission to access one or more of the objects required by this operation. 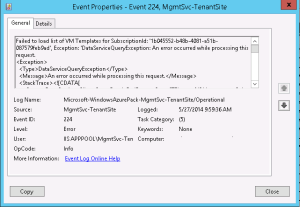 This error seems to occurs every time the VMM applicationpool on the SPF server is recycled. After a change in the plan, or a resync of the plan everything goes back to “normal”. In the VMM Debug trace I see a error that matches the WAP and SPF errors. 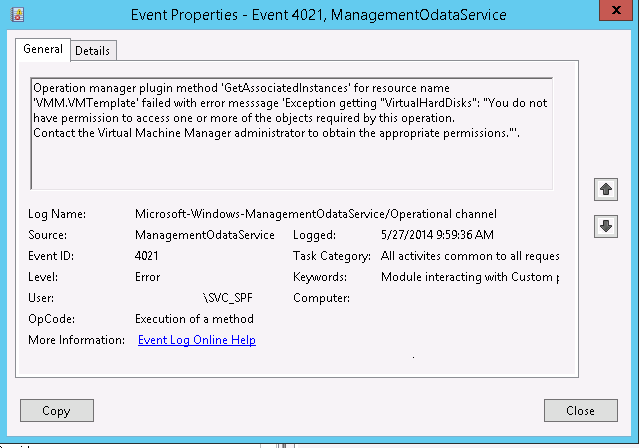 Contact the Virtual Machine Manager administrator to obtain the appropriate permissions. And quickly came to the discovery this is a VirtualHardDisk that my VM Template is dependent on. $libraryObject = Get-SCVirtualHardDisk -ID "9c7bce89-5aa1-4452-bf63-370fccd54304"
$os = Get-SCOperatingSystem -Name "64-bit edition of Windows Server 2012 Datacenter"
The error went away, after a VMM Applicationpool recycle on the SPF server. And I can now recycle as much as I want.. did not see this error anymore. 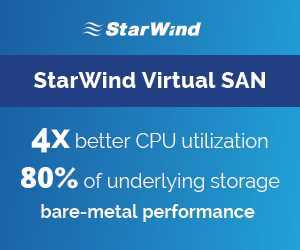 It seems like is has something to do with the VirtualizationPlatform setting, similar (or maybe connected?) to the “Cloud Capability Profile” under VM Templates. I dont know for sure this is the long-term solution, please leave a comment if the above did not fix your problems. Hope it helps, Otherwise we’ll have to stick with the resync workarround…. I think the solution was in plain sight all the time, but went to much on a deepdive with troubleshooting. 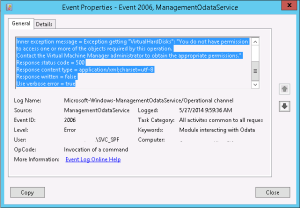 Microsoft.VirtualManager.Utils.ObjectNotAccessibleException: You do not have permission to access one or more of the objects required by this operation. The error is not mentioning the VirtualHardDisk anymore, but a CapabilityProfile Object. *BINGO* The VM Template has CapabilityProfile set on HyperV, the VirtualHardDisk has a CapabilityProfile set to “HyperV” and the Cloud that is attached to the plan also has the CapabilityProfile set to Hyper-V. And still I got a error on the CapabilityProfile “Hyper-V”. Hans Vredevoort pointed me to the fact that for VM Roles you may not set the CapabilityProfile on the cloud your deploying to. 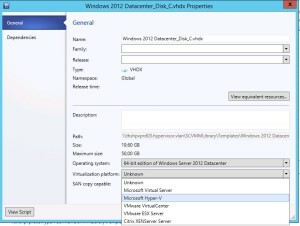 The next step is to uncheck the CapabilityProfile on the VM Template, VirtualHardDisk and Cloud. 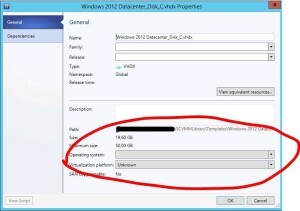 I’ve just got confirmation from a Program Manager of Windows Azure Pack this is fixed in UR4. i was able to fix it by doing the opposite way. Setting and removing the virtulization plattform did not help. 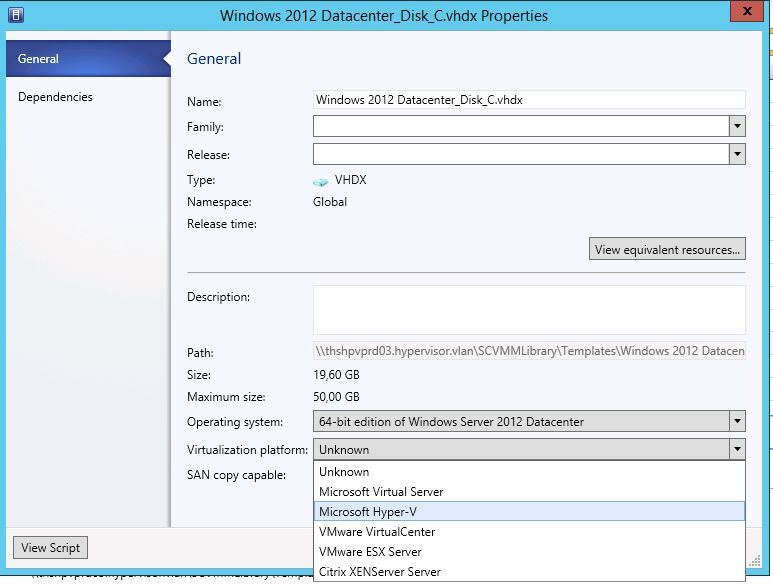 Adding the Hyper-V capability Profile to the VM Template seems to fix the error.. Yes, so it seems the problem is fixed when all the capability profiles are set the same on VM Template, Cloud, VirtualHardDisk. The recommendations for Windows Azure Pack is not to set a capability profile.. did you uncheck it on all three?